This week we move onto what was sort of the second big attack on the Somme, or the second big British effort anyway, which would take place on the 14th of July. While not as big as the first attack on the 1st it would sort of set the template for later attacks where there would be a few weeks of lower intensity fighting with generally small and attainable tactical objectives followed by a larger attack on a larger front with deeper and more impactful objectives. This latter type would be the type of attack on July the 14th and while it would not be a complete success for the attackers it would be a far cry from the earlier disasters. This would also mark the first appearance of the cavalry on the Western Front in quite awhile, if my memory serves me correctly it would be the first time that they would participate in an attack in any meaningful way since way back in 1914 before the lines settled down. On the 14th they would play an important but not hugely impactful role in the fighting. Another group that will make their first appearance in our Western Front narrative will be the Australians. They would not yet be attacking on the Somme front itself but they would take part in a complementary attack to the north that would get the name the Battle of Fromelles. It would not go well. When the planning got started for the 14th, which would come to be known as the Battle of Bazentin Ridge, which I probably will not use as the name again, would involve some disagreements between Rawlinson and Haig. These disagreements had their roots in the fact that there were many places along the front where the attack would be launched that had insanely wide spaces between the lines, upwards of 1,500 yards. This presented a problem to any kind of traditional attack and Haig had sort of just assumed that Rawlinson would do something to move the lines closer together before the next attack, something can could have been accomplished with some smaller attacks that probably would have been successful since it would not have involved actually taking any German trenches. However, Rawlinson did not do this, because he had another plan up his sleeve, he wanted to launch his attack at night. The goal for this attack would be to move the men forward starting right when it got dark, they would follow marker tapes that would tell them how far away there were from the German lines. This would allow the British to be in position to attack as soon as even the barest bit of light came up in the sky. The hope was that this, plus a very short hurricane barrage right before the troops attacked would catch the Germans off guard and give the British troops that extra boost. Haig was not convinced that this was the right move and his objectives came from the fact that he did not believe the men under his command to be capable of executing a night attack. These were the words that he used to describe why not "Our troops are not highly trained and disciplined, nor are many of the staff experienced in such work, and to move two divisions in the dark over such a distance, form them up, and deliver an attack in good order and in the right direction at dawn, as proposed, would hardly be considered possible even in a peace manoeuvre" There is some validity to this line of reasoning because there had been other night attacks attempted earlier in the war. The problem with these previous attempts is that they had almost always been discovered before they were launched due to either noise or just bad luck. In those instances the attack had serious problems because the whole idea of a night attack where you are pushing men out into exposed positions right by the enemy is that you depend on stealth to make up for other shortcomings, like the very short final round of bombardment and the slight disorganization of your troops. Haig was concerned that if the men were seen they would be massacred. However, Rawlinson did slowly but surely win him over to the idea, not that there was any real choice once the date for the attack was planned and the lines were still so far apart. For their attack the British would be arranging for 4 divisions to go forward in the attack with a division on either side of this supporting the main attack. They would also have the 2nd Indian Cavalry Division ready to follow up any successes with attacks of their own. These men were arranged on a length of front that was much smaller than the first attacks, however the artillery support available did not shrink as much as the front did. This meant that about 2/3rds of the artillery support that had been used was now being concentrated on an area of the front that was just a small fraction of what it had been. This would allow for the artillery to reach a much higher concentration which would greatly assist in the attack. This artillery would fire for 3 days before the attack, doing the standard preparation fire for an attack by concentrating on the wire, the German positions, and the supporting positions behind the first line. This would be at a relatively low intensity until the final 5 minutes before the attack started, at which point it would quickly escalate to maximum speed and intensity. The hope was that this quick hurricane bombardment would give the benefits of having that three days of firing but also not give the Germans a ton of time to realize when the final attack would be launched. The British were still not going to focus much time on counter battery fire, which would hurt the long term goals of this attack but would not greatly affect the first effort. This goal, of surprising the Germans would work when the time came, and in fact the attack on the 14th came as an almost complete surprise to the Germans. They had been dealing with all of those small localized attacks that we discussed last episode and some artillery firing at a point in the front was not unheard of. So they sort of expected a smaller attack, nothing on the scale of the effort that was coming their way. This provided them with two handicaps, the obvious one of just not knowing what was going to happen, but then also not knowing the extent of what was happening once it became apparent that this was not just another small attack. This made the German command structure far less efficient at reacting to the British attack because they were concerned that they did not know the full situation and if they rushed troops to that area of the front something could happen elsewhere. During the hours before the attack was launched three distinct groups of British soldiers made their way forward. The first group was a scouting and screening force heavily armed with grenades and Lewis Guns. Their goal was to make sure that they drove back any German sentries and kept the groups behind them safe from any German interference. The second group was very small parties of men who were assigned the job of placing marker tapes on the ground to both direct the last group forward and to also tell them when they were 500 yards from the German front line. The final group was the actual assault units and they moved up last, following the path set by the others. They advanced slowly at a walk until they reached a point 500 yards from the German trenches. At that point they would then slow way down and move forward extremely carefully so that they could get as close to the German lines as possible. They would end 50 yards from the German front, sometimes even closer. Once they were in this position they simply had to wait for the attack to start. At 5 minutes before kick off the artillery began their hurricane bombardment, here is Major Neil Frazer-Tyler of the Royal Field Artillery to give his perspective "The whole world broke into gunfire. It was a stupendous spectacle – the darkness lit up by thousands of gun flashes – the flicker of countless bursting shells along the northern skyline, followed a few minutes later by a succession of frantic SOS rockets and the glare of burning Hun ammunition dumps." at the front the men used the cover of this barrage to get even closer to the German lines. Then as soon as the fire lifted to the next targets the men were off to the races. The Germans, sent into cover by the massed British artillery found that by the time they got back and manned the defenses the British were already on top of them. In this instance the British had almost without exception won the critical race to the parapet. They were helped by the fact that the creeping barrage was actually working as intended this time. It was lifting in much smaller jumps, just 50 yards at a time. It was also making those lifts slower which gave the infantry much more safety in their assault on the first set of positions. They had a kind of steel shield in front of them, keeping the Germans in the second and third trenches from properly helping the first. One of the soldiers on the receiving end of this attack was Reserve Lieutenant Borelli. He discusses the artillery fire and then what happened when the British came forward “During the night 13th-14th July, the enemy increased his fire to previously unknown intensity, eased up between 1.00 am and 3.00 am, then around 3.30 am opened a terrible drum fire once again. I ordered immediate readiness and everyone lay in waiting in the entrances to the dugouts. Just before 4.00 am I realised that the enemy was lifting his fire rather more to the rear. The sentry fired a flare and in the same second bawled, ‘Get out, here come the British!’ Everyone took up position in the shell craters. The enemy had advanced to within twenty to thirty metres of our position. They were surprised by the sudden burst of machine gun fire and our infantry made use of the opportunity to throw hand grenades into the shell holes to our front. All three machine guns were ready to fire in a trice and, by the light of illuminating rockets, we could observe their extraordinary effect. The enemy assaulted in about six waves. These were not dressed lines of infantry; rather they were concentrated groups of soldiers." Borelli's unit was actually one of the more successful German units in the first trenches. All along the front the British had really good success, thanks mostly to the artillery and the fact that the Germans were just totally overmanned. There were only about 4 battalions facing the British attack of 4 divisions. In many sectors this resulted in almost no real resistance when the British hit the first line, and even by the time they reached the second line there was still only very scattered resistance. All that was left of the first two lines were some scattered pockets of German units holding out that had to be dealt with, but not serious resistance. 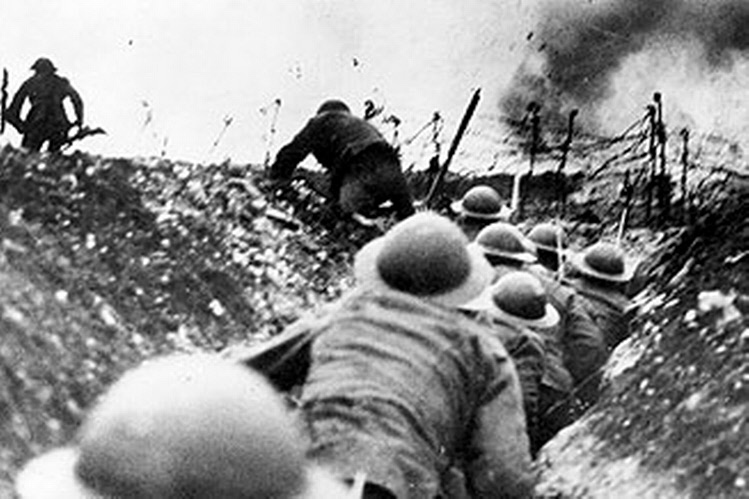 After the first two trenches the British started running into some obstacles. These generally took the form of villages or other geographical features that gave the German defenders a good anchor for their defense. 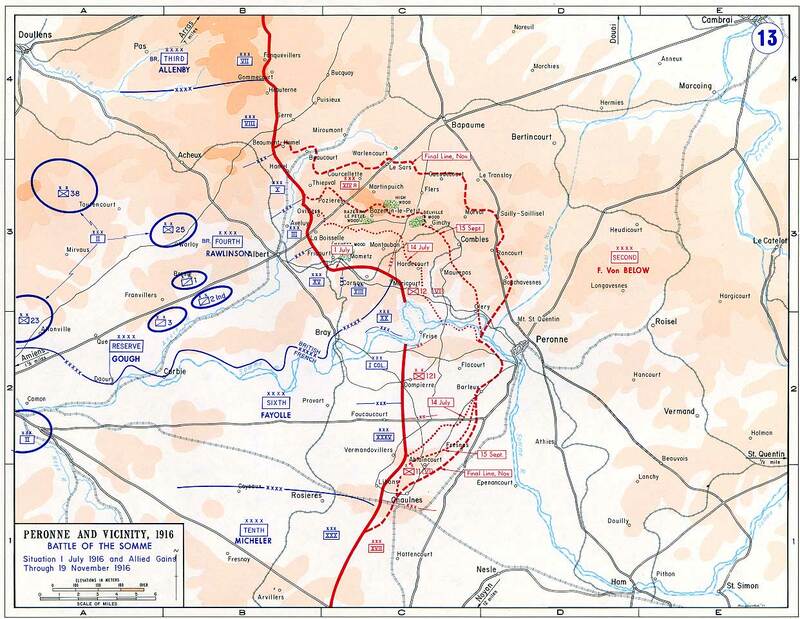 Some examples of thes would be the village of Longueval, Delville Wood, and the positions around the Waterlot Farm. Around these the German defense found itself finally able to regain some of their composure and find a way to hold their ground. This meant that it was time for the Germans to start to try and launch some counter attacks. Here is Reserve Lieutenant Gerhardinger of the Bavarian Infantry Regiment 16 with his account of what happened when his unit was ordered to go forward into one of these attacks "Putting on a waist belt festooned with stick grenades and taking volunteers with me, I arrived on the right flank, where the courageous defenders had already gained a breathing space. They had already shot down more than half a dozen grenade throwers of a British Highland battalion, (absolutely first class human material) and were continuing to fire at the enemy, who were cutting the obstacle in front of the position and also those who were advancing in dense masses to Longueval." All along the front small units found themselves either constantly attacking back and forth as the attacks devolved into countless small unit actions. Here again the officers at the front, more often than not young lieutenants found themselves completely in charge of what was happening with little in the way of support or information. They were required to figure out what they were doing, what was needed of both themselves and their units, and then attempt to execute them in the vacuum of combat. There was still some attempt to launch larger actions though, like those around High Wood. As I have built up during this episode, we are now at the point where the cavalry appear. With how maligned the cavalry arm is in the general evaluations of the history of the war, you may be surprised to learn that they were used here on the Somme. The men at the time were just as amazed. There are many accounts of men seeing this cavalry action and just being amazed that it was happening. Even the most seasoned soldier probably had not seen a cavalry action during the war, unless they had been present way back during the few of them in 1914. Here are just a few of them starting with the British 2nd Lieutenant F. W. Beadle "It was an incredible sight, and unbelievable sight, they galloped up with their lances and with pennants flying, up the slope to High Wood and straight into it. I've never seen anything like it! They simply galloped on through all that and horses and men dropping on the ground." On the German side it was just as incredible to see, if perhaps a bit more confusing "We could make out the heads of horses in the sunken road by the ruined mill, and through the binoculars we could discern the riders. Was it new artillery coming up? A messenger was dispatched to the battalion headquarters! All of a sudden several squadrons of British cavalry surged forward behind the mill in immaculately dressed lines. We had seen nothing of the kind before, and a cavalry attack had never crossed our minds" The goal of this cavalry attack was to assist the infantry in the capture of High Wood which was occupied by the Germans. High Wood had been a small wooded area behind the German front before the attack, however, in the days before the attack it was brutalized by shells as these wooded areas often were. Whole trees had been uprooted and there was just general levels of destruction all around. You may be wondering why the cavalry would be committed into this type of area, that does not sound very horse friendly, and well it wasn't. In this case the cavalry would try and use its best strength, its mobility, to move around the Germans in the wood to set up flanking positions that would then support the infantry attack that would then move into the actual wooded area. They actually fulfilled this goal quite well and were able to maneuver some machine guns to the flanks in a way that no infantry unit ever could simply due to the speed that they could move the heavy guns. Then mounted units then, for the most part, dismounted and supported the infantry. This was not entirely the case though, and in the action on July 14th there was a good old fashioned cavalry charge by the troopers of the 7th Dragoons which came around the eastern side of the woods and found that there was a German unit trying to retreat after being pushed out of their area of the wood. They then found themselves charged by the cavalry, and 48 Germans were made casualties during this action. After this charge the cavalry then continued their advance until they met the third German line, which was manned by intact positions and machine guns at which point they dismounted again, dug into their positions, and waited to be relieved. While the cavalry had some casualties, it was not a complete disaster, although it also did not greatly change the situation for the attack. What this action proved though was that under the right circumstances the cavalry could exist on the battlefield of 1916, and it could work pretty well and be useful, even in an environment that some people would not have expected. Sure it could not create any kind of strategic breakthrough where multiple cavalry divisions rode through the enemy lines, but small tactical advantages could be gained by groups of men who could move quickly across the battlefield. If you want to learn way more about the cavalry, and if you want to hear my full 2ish hour chronicle of the development of, and then defense of their role during the war, head on over to Patreon at patreon.com/historyofthegreatwar. Overall the battle of July 14th was a reasonable success. British casualties were just over 9,000 and for that they had captured a good number of German positions on a decent stretch of front while the Germans had lost around 4,000, although again that number is a bit shaky. Several historians point to the greatly more concentrated artillery bombardment present for this attack as one of the primary reasons for its success and there is definitely a lot of truth to that, but the British still did not know how to advance past the very specific zone controlled by their artillery. And that action probably was not even possible at this point in the war. The Somme had changed from a battle of breakthrough to one of attritional struggle just like Verdun, men and equipment were simply fed into the waiting jaws of death and destruction one after another after another, and the British, especially after July 14th started to firmly believe that the German army was on the ropes, that it could not possible continue. For Haig and Rawlinson this meant doubling down on continuing their attacks with the belief that the next one would always do better. The situation was not ideal for the Germans, not as bad as the British thought, but not ideal. An example of this can be seen in the Bavarian Infantry Regiment 16 which had entered the battle with somewhere around 3,500 officers and men. During the two weeks that it had been at the front it had suffered over 2,600 casualties. Hauptmann Killerman found himself in command of the entire Regiment, a rank of Hauptmann is roughly equivalent to that of a Captain in Western Armies and was well down the list in terms of who would command a unit the size of the a regiment. On the 16th of July he sent a message back to his commander giving an overview of the situation in his unit and asking for assistance in the very near term future, just listen to these numbers in battalions that should have numbered 1,000 men all together. “After obstinately defending the position between Bazentin le Grand and Longueval for the past fourteen days, the Regiment was more or less wiped out during the course of yesterday. The current fighting strength is as follows: 1st Battalion One officer and 147 other ranks 2nd Battalion Six officers and 365 other ranks 3rd Battalion One officer and 111 other ranks Machine Gun Company Twenty-one other ranks Machine Gun Troop 87 Fourteen other ranks Machine Gun Troop 44 One officer and thirty other ranks. I have neither received direction on how to proceed, nor do I expect any, from Headquarters 3rd Guards Infantry Division...I request instructions concerning reorganisation and future tasking...’ Units like that are often on the edge of complete disintegration. While the general attack did not extend much beyond the 14th, there were other attacks that would continue past that date for several more excruciating days. An example of thiw as the struggle to try and capture and hold Delville Wood, which quickly came to be called Devil's Wood for obvious reasons. This was just a small wooded area on the front and it was given to the 9th Division, specifically the South African Brigade. Their objective was to take and hold the wood which quickly turned into a struggle that seemed to go on for eternity. On the 15th most of the wood had been captured from the Germans who had put up one hell of a fight, however, the next day the counter attacks began. This went on day after day and by the 18th there had been 20,000 artillery rounds dropped on this little patch of woods. During this time the South Africans had managed to hold off, for the most part, every German attack even though each effort was met by fewer defenders. When the South Africans were finally taken off the line shortly after they were down to just 785 men, out of a starting strength of over 3,000. They were relieved by the 53rd Brigade, but they just found themselves in the same position as the men who had been there before. The only difference was that they needed to figure out a way to also push back the Germans from the areas that they had managed to recapture. The fighting for the 53rd would continue for 4 days until the 21st, at which point another Brigade was brought it, and so the wheel of time would turn every onward as unit after unit was sent in to be chewed up. The problem was that the wood was just too much of a tactical problem, trying to capture it and hold it was basically impossible for either side until there was a larger attack launched on both sides. Until then the units sent in to keep fighting would just waste away. One group would make their Western Front debut for 1916 to the north of the Somme on the 19th, and that would be the Australians. They were set to go forward in an attack 80 kilometers north of the Somme from in what would come to be called the Battle of Fromelles. 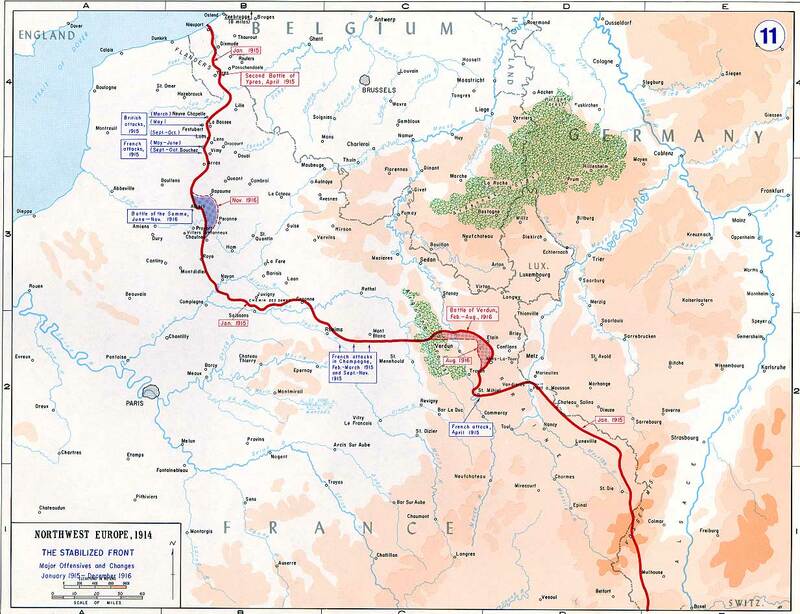 This attack was launched with the goal of testing the German front in this area to see if they had drawn off a significant portion of their strength to the defense of the Somme. If this was the case then the British and the Australians of the 61st and 5th Division respectively should have been able to easily capture the first few lines of German trenches at the foot of Aubers Ridge. While the Australians were well rested, well supplied, and of course ready to get on with it, the 61st Division was the exact opposite, heavily understrength and not prepared for the attack. In fact the 61st division had no business participating in any offensive actions. Before the attack went forward on the 19th there had already been 2 delays of its start date. There was even discussion of whether it should happen at all. In the end it did happen, and the Australians pushed forward and captured some German positions, however the 61st Division was not able to accomplish very much at all. This put the Australians in a really bad spot, and meant that they were destined to be slowly beaten back later in the day, during which they suffered horrible casualties. There was another attack planned for early in the evening on the 19th, but it was cancelled, but not in time to inform to Australian Battalions, the 58th and 59th, and so they went forward by themselves, with predictable results. The Australian division would lose over 5,300 casualties during the fighting while the 61st, which only had about half as many men, only lost just over 1,500. This would be just another example of Commonwealth troops, and for the first time the Australians, feeling horribly let down by the British troops that they were working with. In this case the concerns were legitimate, but the 61st was setup purely to succeed and never should have been in the attack to begin with. I hope you will join me next episode, as the Battle of the Somme continues.